Water Street Home 2017 AWWA Conference—I think we’re going to need more lawn chairs! The American Water Works Association Annual Conference has one concise and clear description: Uniting the World of Water. This year from June 11-14, in Philadelphia, that world will be uniting right in our own back yard. It is altogether exciting and humbling for American Water that all of these individuals representing water companies, scientists and engineers, organizations and other interest groups will come to Philadelphia for the event that in many ways sets the stage for a full year of strategies and work dedicated to the world’s most important resource. It’s interesting, as well as inspiring, to me that ever since we learned about the 2017 conference location, everyone at American Water has referred to it as happening “in our own back yard.” We haven’t said that the conference “will be coming to Philadelphia,” or “is happening in our area” or even “taking place here.” From the first moment we used the term in “our own back yard,” we have embraced this as an opportunity to make the Conference even more memorable and empowering for those attending, much as other cities have done for us over the years. One of the ways we’re enhancing our role as “neighbor” is by opening the doors of our Delran, NJ treatment facility to conference attendees for a tour. This tour, in fact, is already completely booked! That our tour is filled to capacity is, certainly, a source of pride for American Water. But, more importantly, it has us excited to know that so many people are eager to learn about the technologies we are putting to work every day. Some of the features we’ll highlight include 3,000 solar panels being used to supplement the electrical supply, as well as the processes we are using to increase the environmentally friendliness of our facility. The Delran facility also houses our R&D laboratory. Visitors will be able to see how we are doing advanced testing for microbes in water – among a number of other exciting projects! During the for days of the conference, American Water will also have nine experts—including myself—presenting on fifteen different topics. Our group will join with other industry professionals to cover everything from advanced leak detection techniques and goals for reducing greenhouse gas emissions, to solutions for water-supply and infrastructure challenges and innovations in treatment technology. There is one last reason why I’m happy that the American Water team uses the “in our back yard” reference. And that reason lies at the very spirit of this annual Conference—exchange of ideas. Every year, the AWWA Conference fosters discussions, sharing of best practices and conversations about where we are, where we want to be and how to get there. 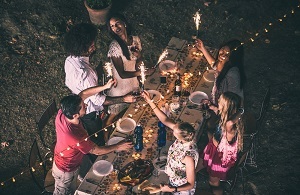 I don’t know about you, but in my experiences some of the most insightful, motivational and productive discussions come when people get together in a comfortable and open environment… in one’s own back yard over a refreshing drink or a good barbecue. Along with AWWA we look forward to helping create that atmosphere and, together, take additional strides forward in protecting our water resources. I look forward to letting my readers in on more of the experiences and outcomes of the conference in future blogs.